I used to create a long to-do list that would have been impossible to finish in three times the allotted period. Not only did I constantly overestimate my capacity to complete my list, I would underestimate the time the tasks would take. In addition, I'd have several creative projects under development at once. I'd dart between them, working on one then the other. None of them got any quality or quantity of my attention. As a result, I always felt like I was falling behind. And I was. I felt stressed and my to-do list consumed my thoughts. Do you have this problem? In today's world, most people take on too much. People try to compensate by multitasking in an attempt to get more done. But multitasking for increased productivity is an illusion. In actuality, less gets done. Research shows it's an inefficient use of time and mental resources. It failed massively when I tried to work on several projects at once. But because we're overwhelmed with everything we have to do, we grasp at straws. And those straws won't keep us afloat. Being overwhelmed means that you're stressed all the time. When you're stressed, you can't think clearly and your productivity drops. Because you're distracted by what's stressing you, your decision making ability is diminished. All your resources are being used to deal with what's going on right now. You're in a fight or flight mode, just trying to survive. Haven't you felt like this? It means you're reacting to circumstances, rather than being proactive, innovative and creative about how to get things done. Overall, you have less emotional resources to deal with life's issues. You're just trying to tread water and progress floats away. Overwhelm, and the stress it causes, impairs personal and professional progress. Think of your mind as a glass that filled to the brim and overflowing. It doesn't have room to add anything more. Your subconscious is simply handling too much and you can't address anything else. You can't focus, because your attention is split into so many different directions. 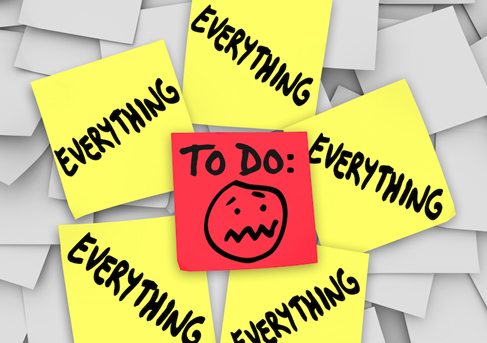 Fortunately, there are some strategies you can use to reduce the feeling of overwhelm. You'll have to concentrate on implementing these strategies, because it's all too easy to get dragged back into the old pattern. 1. Distinguish between what's immediate and what's important. The immediate would be a coworker calling you for advice. They have your attention right now, but you could actually call them back later. Something important would be working on the report that's under a tight deadline. Put off the immediate until after you deal with what's important. 2. Eliminate what's not working. What chores or tasks aren't actually necessary? What's keeping you from working on what's truly important? Certain chores may have become a habit, but aren't helping you anymore. For instance, we all need to check our email periodically. But if you have it open all day, it'll lure you away from your important projects and to check it frequently. Instead, check it only three times a day. 3. Create a strategy to make sure you don't get overloaded. This could be cutting back on your to-do list (like I did). Or you could set a timer to deal with email, easy tasks or a project. Delegate what you can. Don't micromanage others. These all mean that you have to let go of some control. 4. Focus on one thing at a time. This is the opposite of multitasking. When I began to focus on one project at a time, I was able to complete it much faster. It doesn't mean that you have to focus on one project or task and do it to completion. It means that when you're working on it, you eliminate all distractions and it's all you pay attention to. 5. Schedule things. For an ongoing project, set aside 60-90 minutes at a time to focus on it. Keep that appointment with yourself. With all other tasks, put them in your calendar and expect them to take twice as long as you expect. That way you have plenty of time to work on them, and if you finish early, you may actually have time to fit in others. 6. Take time for self-care and self-development. When I was overwhelmed, meditation and self-development were the first things I abandoned. Referring back to #1, this item would be something classified as important. Not only will self-care reduce your stress, but it will give you mental and emotional resources to handle your tasks better. Meditation, reading, exercise, taking bubble baths all contribute to your progress and peace of mind. Over time, I learned to reduce my to-do list to a few items. I would include a few extra each week, in case I actually had time to work on them. But if I didn't, I moved them to the following week. I never got everything done. No one ever does. We're all human beings, not human doings. Reduce your load so you can cultivate more ease, peace and happiness.